This is every adventurer’s paradise! Just name the game and you are sure to find it here, at Hip-notics Cable Ski. Just 3 minutes away from the international airport in the city of Antalya, Hip-notics is home to three sumptuous lakes (L1, L2 and L3) which are around 170 cm deep and filled with lukewarm water running off the mountains. Thanks to its great surrounding, the place offers a range of activities to visitors and opportunity to greet nature up and close. There is 16 obstacle including games like a wakeboard, wakeskate, kneeboard, disc, trampoline, sauna, hot-tub, massage, basketball, beach volley, and ping pong for visitors to indulge in. There is a huge skate boarding park too! Those are not particularly active can start with L1 park which with offerings like Wave kicker, Kicker, Handrail, Low to High Ledge, Step Up, Step Down and such are great for beginners. Equipment rentals are available at the site along with wifi and food. A must visit in Antalya! Accomodations are available. Contact the authorities for more info. How popular is Hip-notics Cable Ski? People normally club together Koprulu Canyon and Concorde Resort And Spa while planning their visit to Hip-notics Cable Ski. Friendly people. The Cable is maintained very well and tension is really good. Lots of obstacles from the known brands. 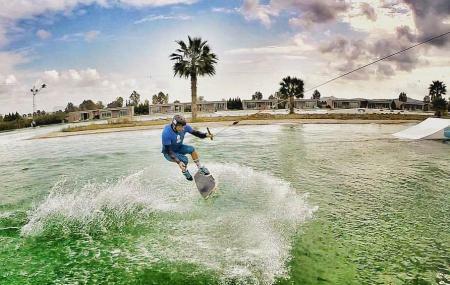 Wakeboardculture is strong in this one!